A rhinoceros hide shield or dhal with four large and two smaller enamelled and diamond inlaid bosses in the form of curled-up cheetahs. An enamelled and diamond crescent-shaped mount fixed to the top of the shield and in the centre, a diamond-shaped openwork ornament inlaid with emeralds and diamonds. This type of 'mount' was usually attached to ornate sashes worn as belt and was probably added to the shield once the Prince returned to England. The edge of the shield is embellished with a gold textile border embroidered with pearls in floral motifs. 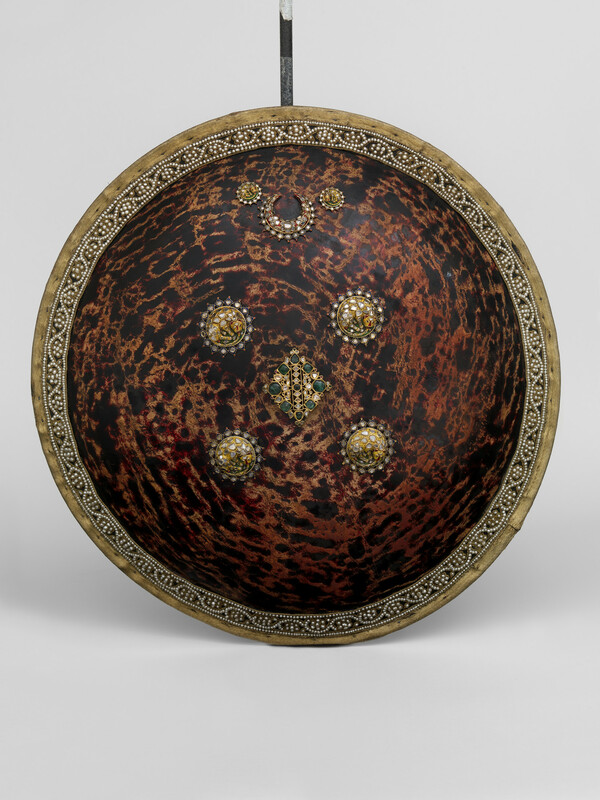 The whole shield was originally lacquered, but by the time of its presentation to the Prince, the lacquer had worn off to leave a speckled surface suggesting that the shield predates the tour. Given the large size of the shield and its lavish ornamentation, it was probably adapted for ceremonial wear.